I'm afraid I don't have a great deal to say about David McVicar's production, but I'm not sure how much there is to be said. It is stark and striking, with a fine coup de théâtre at the conclusion, but it didn't strike me as being very dramatically imaginative. The only substantial pieces of furniture were two huge Tudor fourposters. Subtle? No. Striking? Yes. 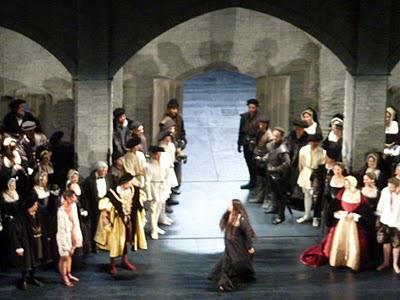 The sets themselves slid and rotated to transform the space, a not insignificant virtue given the opera's length and structure. I liked Paule Constable's lighting, and I loved the opulent detail of Jenny Tiramani's Holbein-inspired costumes, the more striking for being kept to a limited color palette. 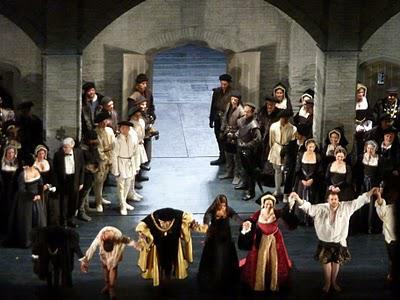 The Met chorus turned in a solid collective performance as the gossipy Tudor court. Keith Miller, whose charisma I have previously admired, demonstrated creditable vocal agility in the role of Rochefort, Anna's brother. As Smeton, the page, Tamara Mumford shone; with elegant and expressive singing, she made the besotted youth sympathetic and engaging. Ildar Abdrazakov, I thought, did a fine job of creating an Henrico whose volatility sprang from an explosive compound of political arrogance and personal insecurity. I like the quality of Abdrazakov's muscular bass-baritone; I've heard him sound warmer, but he was always elegant, and always dangerous. As Percy, the other man in Anna's life, Stephen Costello sounded less than perfectly comfortable. The top notes in his first scene had me worried for him, but his "S'ei t'aborre" was delivered with ardor. He seemed more at ease in the second act, and gave a nice account of "Vivi tu." Ekaterina Gubanova's mezzo had an earthy quality which I thought most appropriate to her high-strung Seymour. The uneasy chemistry between her and Henrico came across well, and her Act II scene with Anna crackled with energy. 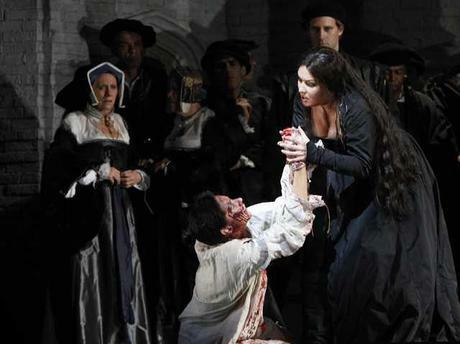 As the condemned queen, Anna Netrebko was fiercely passionate and fearlessly idiosyncratic. I admit to catching my breath when she made her first entrance; from that moment on, she owned the stage. I was won over, but there was much in her performance which could divide tastes. Her runs were fluid, not chiseled; one of the elements of her interpretation which I found most moving and exciting might be off-putting to some: her fearless pursuit of dramatic vocal effect. Deliberate pauses and desperate intakes of breath (desperate for Anna the queen, not Netrebko-as-singer) I found thrilling. The "Per pietà" which she addresses to Percy in their Act I scene, for instance, is succeeded by a pause as she frantically searches for the persuasive "del mio spavento." A silence before "Son io infelice" in her final scene makes it not a statement of the obvious, but a pathetic attempt to convey some fraction of her anguish. Netrebko did not ornament very much that I noticed, but seemed more at home with the bel canto than I recall her '09 Lucia as being. What kept me hooked, though, was her total commitment to Anna's anguished emotional journey. The luxurious lyricism of "Al dolce guidami" showed off her dark-hued tones beautifully; here as elsewhere she used subtle control of dynamics to great effect. The house was rapt (except for the idiot whose cell phone went off. Twice. The second time, they answered it. That Netrebko recalled me to concentrating on the opera instead of devising Horrible Punishments for them is a further measure of my respect.) As Philip Gossett has noted, the words of forgiveness in "Coppia Iniqua" are undermined by the blazing ferocity of Anna's music. Blazing ferocity was what we got. In the final assessment, I'm not that interested in a point-by-point comparison of Netrebko with her predecessors in the role, nor am I equipped to make such a comparison. I do think she made a good case for the value of her interpretation; the power of her performance was, to me, irresistible.